St. Paul’s Henry Rice organized the Bayfield Land Company in 1856, two years after the Treaty of La Pointe opened the region to European settlement. The village of Bayfield was established in 1857. 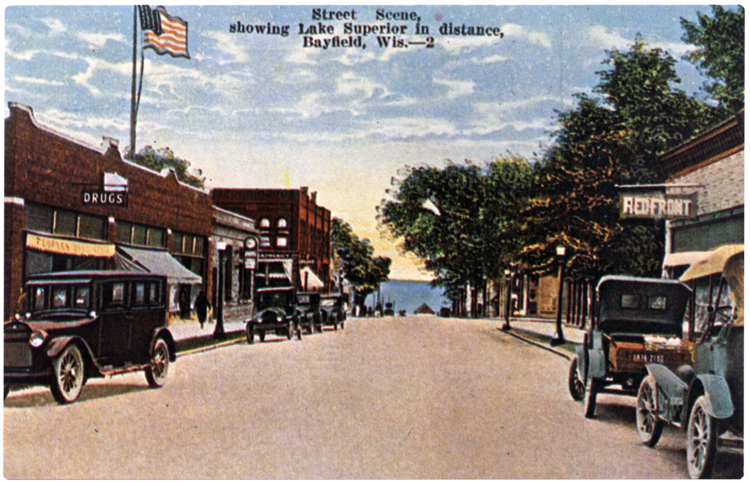 (“Bayfield” comes from British Admiral Henry Bayfield, who had surveyed Lake Superior’s south shore in the 1820s; Rice and Bayfield were good friends.) Within a year the town boasted over one hundred homes. Logging and lumber milling dominated Bayfield’s economy in the 1880s, with the Pike and Knight mills employing 125 people. As early as 1868 R. D. Pike began opening brownstone quarries near Bayfield, and in the 1870s Frank Boutin opened a fishery that shipped twelve thousand barrels of fish in one season. The Booth fishery opened in 1880, employing up to 500 men when fishing was at its peak. Further up the shore toward Superior on the Siskiwit Bay, the village of Cornucopia also played a key role in the Lake Superior fishing industry (the Ojibwe called the bay Siskawekaning or “where the fish can be caught”). Beyond Cornucopia at the mouth of the Flag River, Port Wing was established in 1891 by Finnish immigrant Axel Johannson; the town also served the fishing, logging, and sandstone industries.